I don’t know about you, but just thinking about lime and coconuts feels like the right thing to do about this time of year. We started making this summer coffee cake a few years ago, and it was a surprise hit. It’s the taste that hooks you. Lighter on the tongue than our other coffee cakes, it's fresh, zesty and maybe even a bit tart—in a good way. It makes me think of white shoes, chiffon dresses and mint juleps. 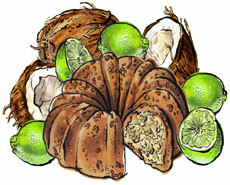 Made with organic flour, and loaded with slow-toasted coconut and lime. Of course it has our usual assortment of everyday heroes like fresh eggs, vanilla and real butter. Very moist, very easy to polish off a whole one on a lazy afternoon on the patio. "Summer fling coffee cake is the best we've ever had. We shared it and everyone said the same thing. Being good doesn't even begin to describe it. A person who rarely eats even had TWO pieces so you know it's good." "That is the best cake I have ever put in my mouth."